We give them all directly to children in need. The children we serve are very poor, but there are “poor kids” and “POOR KIDS”. Most children we support are educated and live on dirt floors, under thatched roofs with woven rattan walls. The children wear cast-off clothes and old shorts for underwear, most of which has deteriorated to little more than rags and their learning centers are very sparsely equipped. Gift of Happiness Foundation has a policy of only purchasing from manufacturing companies who we know to be respectful employers of staff aged over 18 years who are legally allowed to work in Thailand. We only deal with companies who ﻿﻿DO NOT﻿﻿ use cheap or child labour and we try to purchase from companies who employ people living close to our urban work base which is located in one of Bangkok's poorest suburbs. "This as a real 'Win-Win Situation' for poor kids, the staff at these ethically sound factories and all the great people who sponsor these essential goods!" Now you can buy as many sets as you like and we will deliver them directly to the children in most need. Gift of Happiness Foundation give tons of used clothing to hundreds of children in need every month. But pre-owned underwear is not often donated for obvious reasons. In August 2014, we sourced an ethically sound supplier of brand new underwear and have already given a little more dignity and comfort to some very grateful poor kids in Thailand. 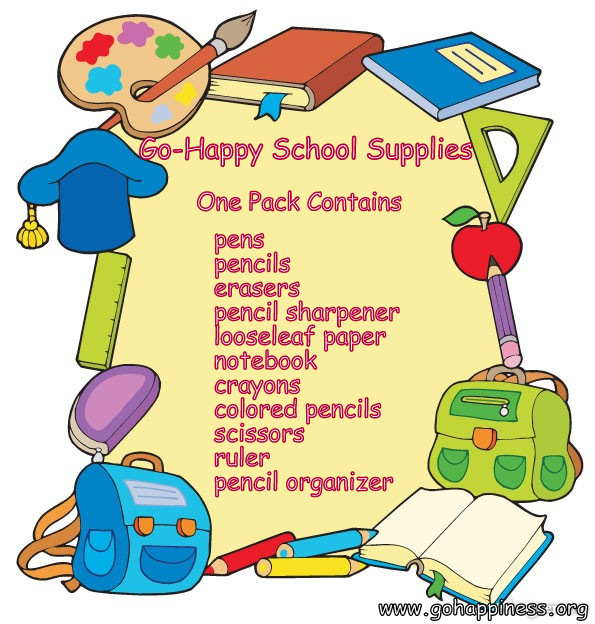 Educational supplies for children who really appreciate it! Gift of Happiness Foundation supplies hundreds of items to help poor children study with the same basic equipment as more privileged children in better developed environments. This basic educational pack offers these children enough materials to complete one term of study and the exams needed to get them to the next stage of education. Here is what one child will get for only $10.00! 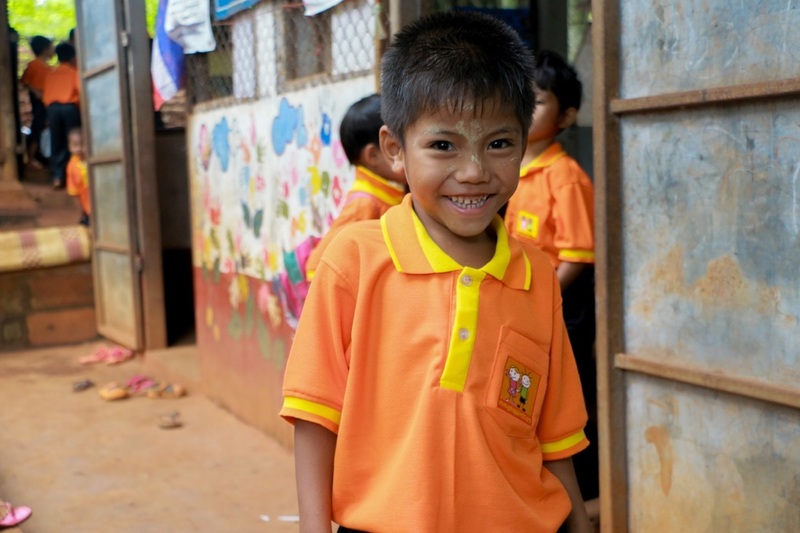 Uniforms give poor children dignity and self confidence anywhere they gather together. Gift of Happiness Foundation provides children with uniforms that are practical, hard wearing and easy to keep clean and dry in difficult living conditions. These are not the regular school uniforms like the ones worn by children at most government schools in Thailand. That's because parents or guardians don't have washing machines or even running water, except for the local stream. Every item you buy is added to the load of other goods that fill our trucks 'once-a-month' when we visit some of the neediest children in Thailand. Start a campaign to buy 100's of essentials easily. 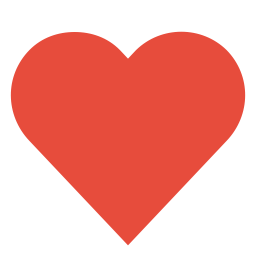 ﻿Groups of people can easily raise enough money to buy loads of goodies. Start something going on social media or at school, workplace, friendly society, pub quiz teams, sports, running, cycling, swimming, golf or auto clubs. 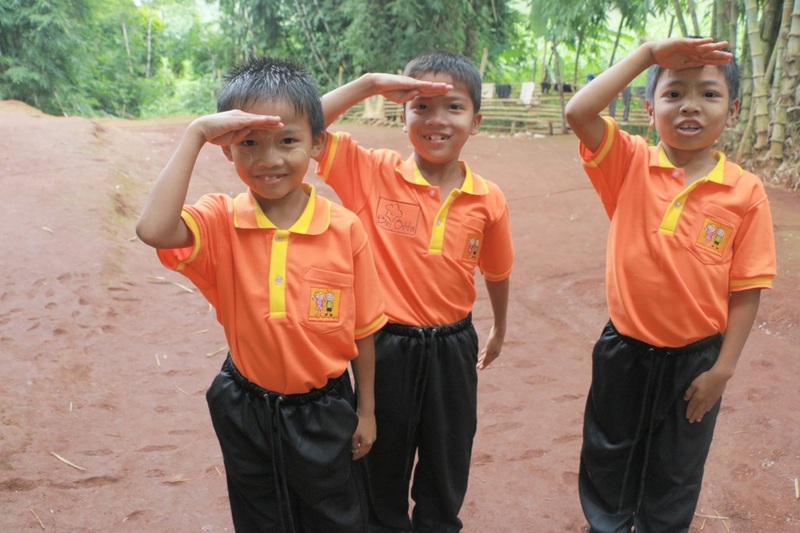 Children are delighted to get New Uniforms at Remote Village Schools in Thailand. Shop online here or from our Go-Happy Amazon Wish List for these essential goods from anywhere in the world!